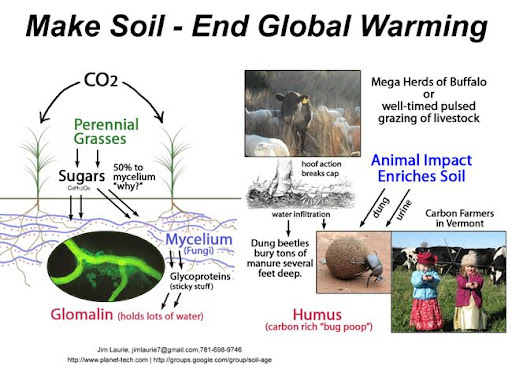 Soil Presentation at Stockholm Environment Institute, 2009 | Planet-TECH Associates: Trends. Innovations. Opportunities. Jim and I presented at the Stockholm Environment Institute yesterday, March 18, 2009. The talk was positively received. As a result we have been invited to co-author a technical paper on the potential for carbon sequestration in soils. See all the videos segments from the presentation: SEI Presentation Playlist. What to do with 150 Gigatons? The presentation explores the role of grasslands restoration as a key component for climate change mitigation. There is a growing body of research that suggests that grasslands are undervalued as a carbon sink, and that their potential for safe, quick, and long lasting sequestration may be as high as 10 GT/year. This far exceeds other options and may be achievable in a manner that is non-polluting and economically viable. The strategy calls for a reevaluation of how we think about soil health and the role of animal impact. Grasslands and grazing mammals co-evolved about 50 million years ago when atmospheric CO2 was close to 800 ppm. Today, grasslands are the world's largest terrestrial ecosystem and a prodigious carbon store. When Lewis and Clark explored the Great Plains, they were walking on a veritable ocean of sequestered carbon that was held in dark, moist, soils up to three meters deep and stretching for thousands of square miles. The grassland ecosystem that held this carbon was made possible through the collective impact of billions of prairie dogs and tens of millions buffalo and other graving mammals - a fact that has been largely forgotten. Unfortunately, the Great Plains, and other native grasslands, have been gravely depleted - diminishing their carbon caring capacity and accelerating desertification. The good news is that through coordinated animal impact, soils can be readily restored to their original health, and in a manner that is low tech and cost effective. The global adoption of this approach offers promise for helping us to bring atmospheric CO2 down to safe levels (below 350 ppm) in a time span sufficient to avoid catastrophic consequences. The presentation will advocate for greater research into this strategy. Jim Laurie is a biologist focused on biodiversity and ecosystem restoration as the key to creating a better future. Recently, he has been researching grassland restoration and its importance as the essential process to reverse global warming. Mr. Laurie has 30 years experience working for industry, nonprofits, futures think tanks, and educational and environmental interests. For 20 years Jim worked in the Houston petrochemical industry as the Laboratory Training Supervisor and Environmental Biologist with Bayer Corp. While at Bayer, Jim implemented industrial wastewater experiments using purely biological processes. Working closely with ecosystem visionary, Dr. John Todd, Jim managed the startup of the "Vermont Living Machine" project in South Burlington, Vermont. This EPA funded project demonstrated ecosystems can effectively treat municipal wastewater without toxic materials. In 2005, he worked with business and environmental groups in California to create a restoration plan for the Eel River Valley. The goal is the restoration of salmon runs and redwood groves in an area that has been largely deforested. More recently, Jim worked with Pogo Organics in Sunshine, Maryland, on the cultivation of mycelial networks for ecosystem restoration and mushroom culture. He also spent a summer volunteering with the International Wolf Center in Ely, MN learning and teaching about wolves and bears. Mr. Laurie has spoken to numerous groups on the role of soils in climate change mediation, and has been featured on EcoShock (www.ecoshock.org), a weekly internet radio show. With his colleague, Seth Itzkan, he started the Google group Soil-Age. Mr. Laurie served as a 1LT in the U.S. Army as a Medical Operations Officer. He has a BA in biology from Rice University and an MS from University of Houston in Studies of the Future. Seth Itzkan is President of Planet-TECH Associates, a consultancy focusing on trends and innovations for sustainable economic development. Seth has twenty years experience consulting with private non-profit, municipal, state, and federal agencies on strategies for success in changing times. His clients include The Boston Foundation, The U.S. Census Bureau, The Massachusetts Technology Collaborative, and the City of Haverhill, Massachusetts. For the past four years he has been consulting with The Boston Foundation in the design, research, and implementation of a prominent feature of their Indicators Project, titled The Hub of Innovations. The objective of this work is to highlight innovations germane to municipal quality-of-life improvements. Seth is profoundly interested in climate change mitigation and is investigating new approaches to the problem, particularly the role of soils and grassland restoration. With his colleague Jim Laurie, Seth has co-authored a paper on the topic titled, New Considerations for Climate Change. They have created a Google group, Soil-Age, to further explore the issue. Seth is a gradate of the Tufts College of Engineering and the University of Houston Masters of Science Program in Studies of the Future. The water cycle stuff is key and in fact it may be what gets SEI's interest. The Maddoxes don't use anything but rainwater, but as the grass comes back there is more stored in the ground all the time. Instead of rainwater running of the land in a day or two carrying a lot of soil with it, they now have streams that run for several weeks and the water is clear. The goal of course is to bring back the days when these streams can run all year like they once did. In 2002, when they started on this ranch, there had been no grazing for 15 years and there no perennial grasses to speak of. The ranch was 68% bare ground. Much of the surface was hard and cement like and had lost the ability to absorb water. Anyone who has been to dry climates knows what this looks like. There was and still is woody vegetation like mesquite which most Texans blame for taking away the moisture. Many Texans drag and burn mesquite and then plant seed and fertilize the land and then they may try to irrigate to make hay or use as pasture. This is an expensive way to make a living. The Maddoxes don't do any of that. Also, they are running these cattle and sheep at 2.5 to 3 times the recommended stocking rates for that area of West Texas. The key for them is the health of perennial grasses. Their bare ground in 2007 was down to 31% from 68% in 2002 largely because of the return of these grazing dependent grasses. The key to perennial grass health is the timing of the grazing not the numbers. They have 25 paddocks and run their entire herd in one 400 acre paddock for a week. Then the herd moves to a paddock that has been free of major animal impact for 6 months. The paddock they left behind is full of the animals' nutrients, the dung and urine are very important for the recovery of the grass. Dung beetles bury the manure as little packets for there babies, who begin life underground. A few years after dung beetles reappear, the earthworms, ants, nematodes, and other life in the soil begins to thrive again. This is because the land has more organic material and now holds much more water. (A ton of carbon sequestered per acre per year?) The Maddoxes don't use pesticides because they know that it would kill dung beetles and the other life in the soil and their water cycle would suffer. We used to think that was the key to the story, but, then there is the fungi. Fungi mycelium will take all the sugars the perennial grasses will give them to make glomalin. This glycoprotein material is quite inert, but it is very sticky and makes the soil clumpy. The air spaces created allow the soil critters to breathe and do their thing. Glomalin is designed for a much more important task, however, it stores huge amounts of water. The perennial grass fungi system wants to stay for the long haul in this "brittle" environment. Brittle environments have dry seasons. They represent perhaps 2/3rds of the landscape of terrestrial earth. If there is enough moisture in the soil, the fungi can thrive and move nutrients to the plants in the landscape. They maintain the plants to keep the ground covered, otherwise, the soil would dry out and mycelia would disappear. On way to destroy mycelia is to use chemical nitrogen fertilizer. When these are used, the bacteria predominate in the soil and consume the fungi. In a healthy soil, the CN ratio is higher and fungi do well. They can dissolve rock particles and supply nutrients to plants. With well timed grazing the urine and dung provided by the grazing animals and the dung beetles sequestration team's work will provide plenty of nitrogen to the system. The Maddoxes do feed some supplements to their herd such as cotton seeds that are plentiful in Texas and quite good for the animals. They are in a very dry hot part of Texas, but the animals are free of disease, perhaps partly because they are eating grass and not grain. They have been near Ozona now for seven years and new species of grasses continue to show up from the animal impact. If organic matter in the soil was not increasing, they these "eastern grasses" would never be able to thrive. Joe Maddox said he would love to see pronghorn antelope on the ranch, he knows that they don't often jump fences like deer, so it may awhile before they figure out how to make that work. He is not concerned about antelope competing for grass, but he sees them as another source of nutrients for the soil. I asked him about prairie dogs. He said that they are a part of the system and they would probably help the soil. At any rate, it would be fun to do the experiment. When I asked him what his biggest dream was, he said he would love to work with the Native American tribes that are restoring buffalo to their lands. He mentioned the Soiux Reservation in South Dakota, especially. He said that he felt a debt to Native Americans to share what he was learning about the land, but also realized that he would be learning a lot, too. Neat stuff. Joe and Peggy Maddox and their small team have restored two ranches since 1986. The first one was 22,000 acres. (1986 to 2001) The present "West Ranch" is about 12,000 acres. If they are able to sequester 1/2 ton per acre per year, which might be low, it would calculate out to more than 200,000 tons of carbon put in the ground. (Or more than 700,000 tons of CO2 taken out of the air.) Not bad for one family. This was not their concern, when they started of course, but they are excited that there is one more reason to restore soils. What about methane? Well, many things. If we are making lots of aerated soils around the world, then the aerobic bacteria would love to use methane as a nutrient. Good soils would scrub methane out of the air pretty thoroughly. The dung beetles bury manure rapidly in a healthy system. The little bit of methane that comes directly out of a grass fed animal attracts the dung beetles that depend on their manure. Methane is a problem on factory farms. I have been to North Carolina counties where hog and turkey farms are everywhere. There is so much manure, that they don't what to do with it all. most of it is put in lagoons. Because the lagoon system is soon anaerobic (no oxygen), the carbon in the manure is made into methane by anaerobic bacteria. We could smell a lot of hydrogen sulfide (rotten egg smell) in this area, too. We were getting sick being in the area for a few hours. The people that live there must be having a terrible time. Another thought about methane. Grazing animals in the billions once roamed huge grasslands on most continents. Methane in human experience was not a problem until rather recently as the animals have been taken off the land. I don't care if the animals are buffalo, antelope, cattle, chickens, prairie dogs, water buffaloes, zebras, or kangaroos; if they help create perennial grasslands and put carbon in the ground, we want them and in herds. Hopefully the "Buffalo Nation" movement will grow, and "Antelope Nation" will be created and thrive. Nutrition? Jill Stein's work shows that meat is not automatically unhealthy. If the animals eat grass, the omega-3 to omega-6 ratios are healthy, the fat is less. Eggs from grass feed roaming chickens are a good food, too. As far as all the human issues getting in the way of rational decision making, I don't know how or if we will figure that out. It will take a lot of us working and learning together. What I do know is that nature already knows how to do this and if we worked with these natural system processes we'd have many more options and abundant opportunities without the need for exotic technologies or fossil fuel energy.